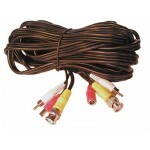 We carry all types of camera wire for surveillance and security camera setups. 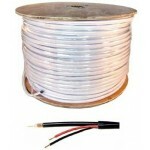 We have video cable in spools and pre-cut lengths of RG59 Coax Cable, or RG6 coaxial cable. 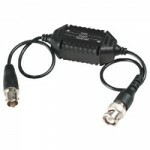 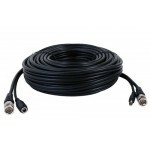 Coax cable is just the video wire by itself and is good for running CCTV video signals up to 300ft max. 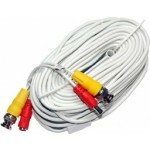 We also have all-in-one security camera wire that is made up of video and power cables. 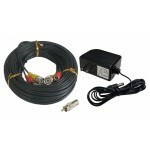 The power cable is standard 18 gauge wire and the video part is RG59 coax cable. 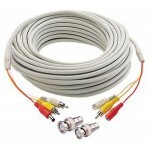 This type of camera wire is available as a spool of wire in 500ft or 1000ft lengths without any connectors, or as premade cable with bnc connector for video and 12V DC jack for power already attached to the camera cable from the factory. 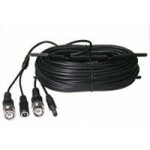 This siamese camera cable is the most popular since it makes security camera wiring very simple by letting you supply the power from inside where the DVR is located. 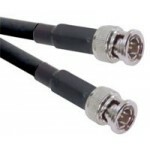 If you are getting a spool of either coax cable or siamese cable be sure to also purchase BNC Connectors and power pigtails for each camera.